I’m not a crier. I may have mentioned this before but it’s worth repeating. I am not one to get emotional at movies, books, TV shows or songs. Except for that ASPCA animal cruelty commercial with the Sarah MacLauchlan song playing in the background. My heavens that is like a arrow straight to the heart! I have to immediately turn the channel or risk a meltdown and then emergency run to the Humane Society to buy up every last puppy there. At any rate, I may not cry a lot but I do feel emotions. Despite popular opinion that I am “Hard-hearted Hannah from the South of Savannah” (cough MOM cough), I really do feel things. 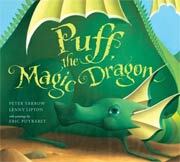 One powerful image I have from childhood was with a certain dragon named Puff. Really? REALLY?! This is a children’s song! Come on, man! Every time I heard that song I would get sad and want to cry. Poor Puff! I have outlawed that song from ever being played in my presence again, along with the movies Fox and the Hound and Bambi (come on Disney!). My mom gave Isabella a “Puff the Magic Dragon” book today. And behold! It came with a CD of the song! She assured me that no, this was a different ending, a happy one, where Jackie comes back with his daughter to play with Puff. Great! All is well in the world. I even played the CD in the car on the way home. It was not a new version. It was the original version. And the weirdest thing happened. My eyes started leaking. There must be something wrong with them. Most likely a side affect of getting older. Isabella fell asleep so she didn’t hear most of it. Someday we’ll have to explain it to her though. Or I could ban it from ever being played again. EVER.